If you’re here, you already know how important it is to find cash buyers for wholesale deals. It’s the lifeblood of your wholesale business! That’s why we’re going over the 17 best ways to find cash buyers for wholesale deals so that you can grow your real estate investing business. These searches will show you the real estate investors in your area who are serious about their business. If they have put in the effort to show up in Google searches, then they are serious about house buying. Just like searching for motivated sellers, looking for cash buyers for wholesale deals is about finding which investors are serious. Find them online, go to their website, and submit your information to them! That was kind of a lot, let’s break it down to make it easier to understand. Like we said, this is more research heavy. You have a lot of other important things to do with your time. This kind of work can be delegated to an intern or office assistant. That way you won’t have to spend all day at a courthouse pouring over records. While money lenders won’t be the people to actually buy your properties, they definitely know people who are great cash buyers for wholesale deals. The more money lenders you can befriend and build a working relationship with, the more opportunity you’ll have to find cash buyers that they work with. 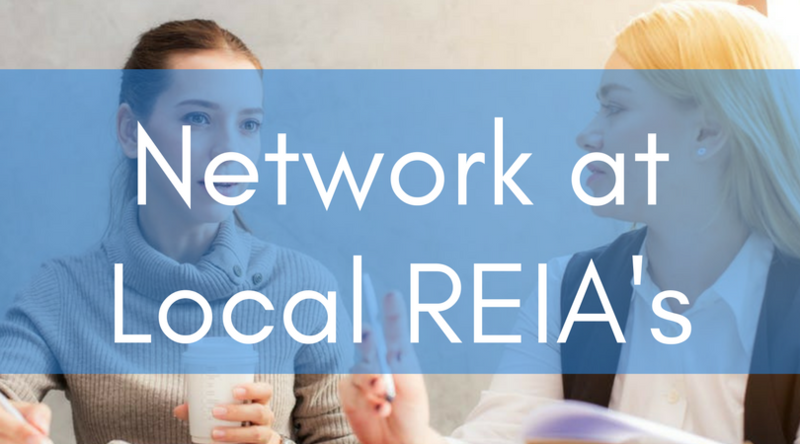 Your local REIAs are a great place for you to meet other real estate investors in your area. If you aren’t networking at your local REIAs then you’re missing a great opportunity to find high quality cash buyers for wholesale deals. Finding your local REIA is as easy as doing a Google search. Once you find it, make sure you attend a few of the meetings (if you aren’t already). This is a perfect opportunity to meet all the different real estate investors in your area and build connections with them. 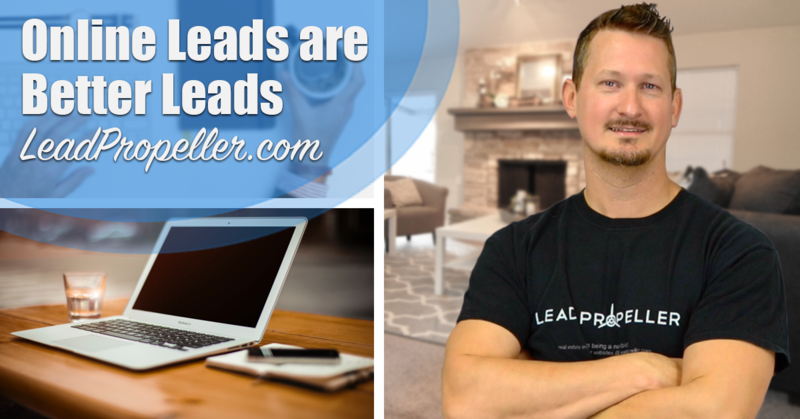 Making connections with as many people in the real estate investing industry will help you grow your business. Not to mention the bigger your business gets, the easier it will be for you to find cash buyers for wholesale deals. Don’t forget realtors! While a realtor might not buy your properties for cash, they can redirect you to someone who can. Just like a well established real estate investor, a good realtor has connections that you can benefit from. When you want to find cash buyers for wholesale deals, it’s all about who you know. Our last blog post has a section that specifically addresses Craigslist ad strategies for real estate investors, but we’ll go over it here too. But first, download your free Craigslist Ad Template for Wholesalers by clicking the button below! 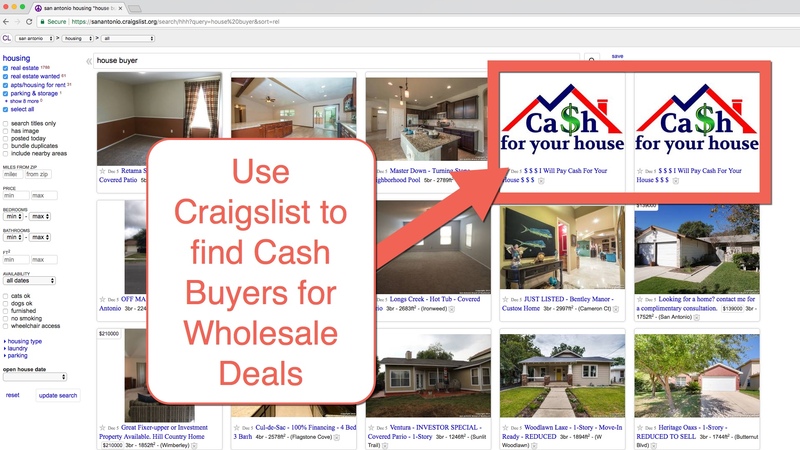 Alright, let’s talk about how to find cash buyers for wholesale deals on Craigslist. First and foremost, you need to be looking in the real estate section (duh, I know). Simply typing in “cash home buyers” in the search bar isn’t enough to really narrow down your search. If you do that you’ll end up seeing a lot of home appliances, hardware equipment, or things that have the word “cash” in the title. A better search to do is simply “real estate investor”. You’ll most likely see a lot of other wholesalers, or investor who are selling a property. However, you’ll also see a lot of people posting things like “We Buy Houses for Cash!”, “Sell Your House for Cash!”, or “Cash for House”. All of these posts are done by cash buyers. See how simple it is to find them? Now making them come to you is a different story. On the next day, duplicate and slightly modify all of your ads with different headlines. Change up the body text slightly, change the pictures, then post the altered ads. Now you should have 30 ads posted in total. On the following day, you should be able to log in to your account and renew the first day’s ads. This keeps them fresh and at the top of the search results to be seen. 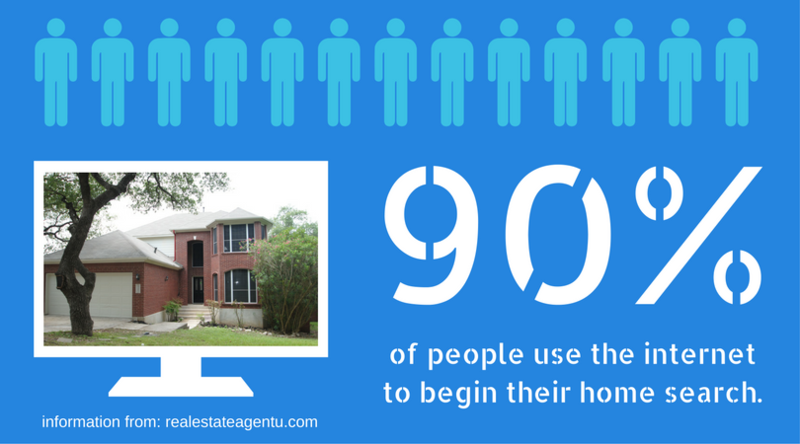 This is another reason why you should be networking with realtors. Since you’re an investor and not a real estate agent, you don’t have access to the MLS. But they do. When you’re connected with them, search the MLS together. Search for houses in your target market and add a field labeled “Finance Code”, then choose “Cash”. Now you’ll be looking at cash house buyers for your target area. To make sure you’re contacting investors and now homeowners who live in the properties, look for a mailing address that’s different from the property address that was bought. Bing, bang, boom. Now you’ve found cash buyers for wholesale deals on the MLS. It’s really that easy. The next step is to contact them and add them to your buyers list! The one caveat is that you need a connection who’s a real estate agent. If you don’t have that connection, you’re not going to get access to the MLS. I mean, duh. We talked about searching online for cash buyers, but they’re also searching online for you. Which is why you need a website specific for your wholesaling business. If you don’t have a website dedicated to wholesaling, you won’t show up in Google searches. Since “80% of all home buyers are searching online“, it just makes sense to have a search engine optimized website (Contactually.com). Just like getting motivated sellers to come to you, you want cash buyers to come to you as well. The best way to get cash buyers for wholesale deals is to have a website that is built specifically for them. That’s why LeadPropeller has wholesaling websites just for collecting cash buyers’ information. Right on the front page of your LeadPropeller wholesale website is an opt-in form for visitors. We’ll talk about this further down. The important takeaway is that our dedicated wholesale websites are built in with on-page SEO that will make you rank higher in local Google searches for wholesalers. On top of that, our high converting designs make it simple for cash buyers to leave their information with you so that you can build your wholesale buyers list. Really, there’s nothing better for having cash buyers for wholesale deals come to you! Want to see how it works? Check out a live demo of our wholesaling websites to see if it’s the right fit for your real estate investing business! The bigger your email list is, the easier it is to find cash buyers through email marketing. For more details, check out our email marketing article here! Offline marketing is just as important as online marketing, including newspaper ads. A lot of people think that newspapers are dead, but that’s just not true. 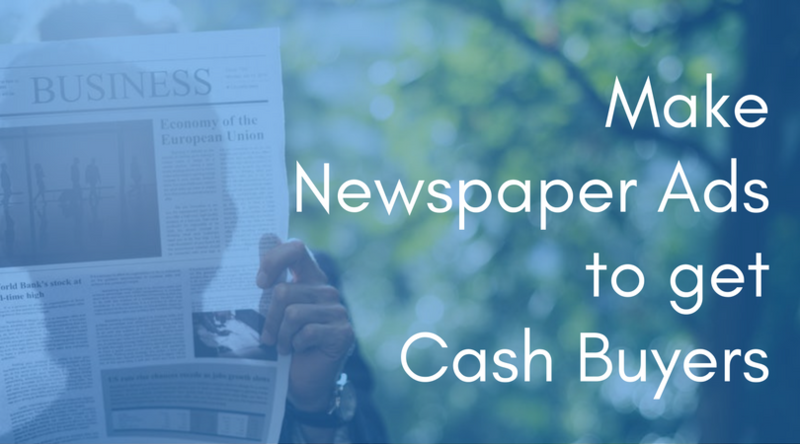 Don’t get us wrong, it’s not nearly as effective as online marketing, but that’s not to say that there isn’t a market for newspaper advertising. Make a guarantee and stick to it! You have to be a little more tactful with this method. Unlike straight up marketing, this involves more communication and salesman ship. When you contact local landlords, start by asking them if they’re interested in buying anymore properties to manage. If they do want to, great! Land the deal and keep them as a future contact. If they’re not interested in buying more properties immediately, you have some options for where to go from there. First, ask if they’re interested in buying more properties in the future and add them to your buyers list. If they’re a big landlord, they’ll most likely be interested in buying more properties at a later time. Don’t give up on them, they aren’t a cold lead yet. Second, ask if they’re tired of being a landlord and if they want to sell. This is a great way for you to get more houses to either wholesale or flip. If the landlord doesn’t have a lot of properties, they might be looking to get out of renting all together. If they do have a lot of properties, there might be one or two they’re interested in selling. Either way you work the conversation, you should be able to get some kind of meaningful deal from them. Because you want to find more cash buyers for wholesale deals, you’re not attending auctions to buy, You’re there looking for cash buyers who are there. 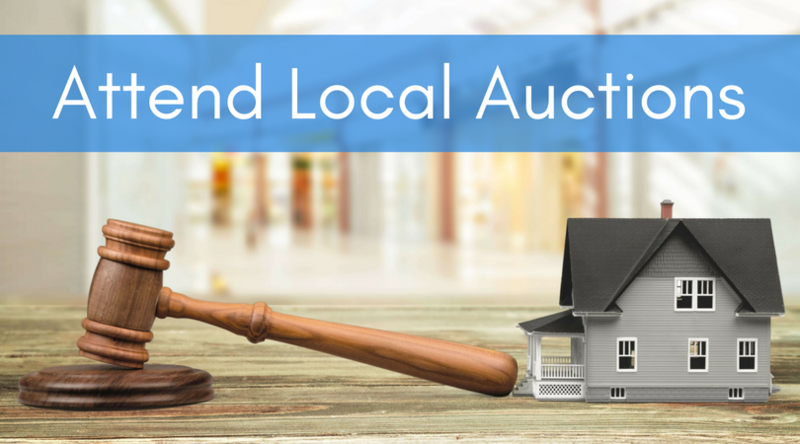 Auctions are a great place to find local investors and people who are good to pay cash for houses. I.E., your ideal audience. Hands down, the best thing about BiggerPockets is that it’s an entire social media platform that is made specifically for real estate investors. Unlike LinkedIn, where you have to search and make your own network of real estate investors, BiggerPockets is exclusive to people in the real estate industry. Which means every connections you make on this platform is a new investor connection. All of these sections of BiggerPockets will help you network and find cash buyers for wholesale deals in your target area. If you haven’t already, you should definitely make a BiggerPockets account! Once you have a website for your wholesale business, you need to have opt-ins to collect visitor information. Instead of finding cash buyers for wholesale deals, let them come to you. Remember how we talked about looking for cash buyers in Google searches? If your website shows up in Google searches that cash buyers are doing (searches like “investment properties”, “wholesale house deals”, “wholesale real estate”, etc.) then they’ll go to your website. Once their on your website they’ll want a way to give you their information. That’s why you need an opt-in form on your website. It needs to be something simple for visitors to work with. Just their name, email, and phone number. That way, submitting their information to you doesn’t feel intrusive. Like Flip Pilot! FaceBook groups are a great way to instantly communicate with other active real estate investors. Unlike the days of the early internet, chat rooms aren’t really a thing anymore. No one goes to a website that’s only a chat anymore because social media has made online communication so streamline. That’s where FaceBook groups come in. They function very similarly to the chatrooms of the early 2000’s. You can find groups for basically anything, even for real estate investing. 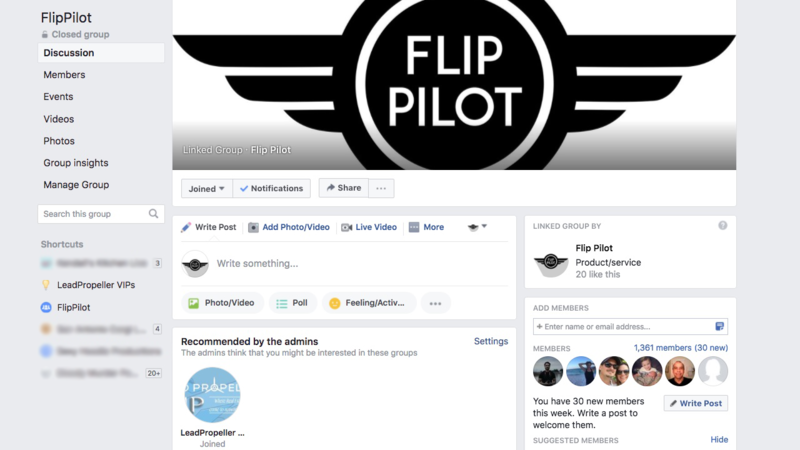 The Flip Pilot group is the fastest growing FaceBook group for active real estate investors, making it a great place to find cash buyers for wholesale deals. In fact, the members of the Flip Pilot group frequently post their business’s information so that they can network with investors in their area. Since there are investors from all over, it’ll take no time to find great cash buyers in your target market! Similarly to newspaper ads, bandit signs are great for getting your name out there (even if they’re not as high converting as online marketing). Bandit signs do still have a decent conversion rate for finding cash buyers for wholesale deals. However, you’re throwing out your business’s information and hoping that local cash buyers see it instead of them coming to you. Make sure that you keep your bandit sign concise, clearly stated, and to the point. Since bandit signs are on the side of the road, cash buyers will be seeing it from their car. If the words aren’t huge and easy to read, you’re not going to get a call from them. 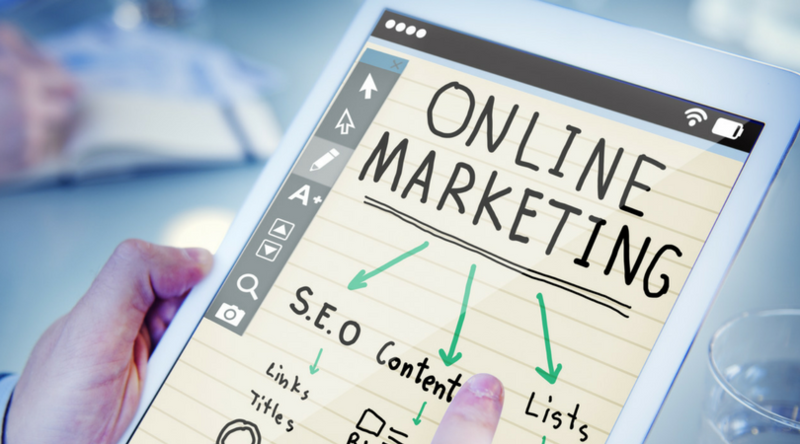 We’ve talked about online marketing in length in our other articles, but we’ll do a brief crash course again here. The two basic types of high converting online marketing are SEO (search engine optimization), and PPC (pay per click). Search engine optimization is all about making sure your real estate investing business shows up in Google searches. Hopefully by now you’re convinced that you need to be easily found online. Search engine optimization will help you attract cash buyers for wholesale deals by increasing your rank in Google searches. In fact, we have an article called “5 Tips to Increase Google Ranking for Real Estate Investors“, check it out! The one thing about SEO is that it takes time to effect your rank in Google, roughly 8 – 10 months in most cases. That’s completely normal, and entirely worth it. Strong SEO from blog posts and relevant backlinks is a cheap way to get organic cash buyer leads. Pay per click is a more immediate form of online marketing. Like in the name, though, it’s a pay to play game. You do have to put down a good amount of money for a campaign, but it’s absolutely worth it. When you launch a strong PPC campaign on something like Google AdWords, your business appears above the organic search results for the keywords you paid for. We wrote an article titled “3 AdWords Techniques for Real Estate Investors” so that you can get a better idea of how to make a strong PPC campaign. Appearing above organic results is great because the top 4 Google search results are the most clicked on. If you’re appearing at the top, you’re more likely to get the visitor. Always remember that, just like any other marketing, PPC is an investment. If you want the best return, you’re going to have to spend a little extra. It sounds like gambling, but if you have an online market who’s an expert at what they do it’s all worth it. The first lead you get from a solid AdWords campaign will pay for itself. What Will You Do To Get Cash Buyers for Wholesale Deals? 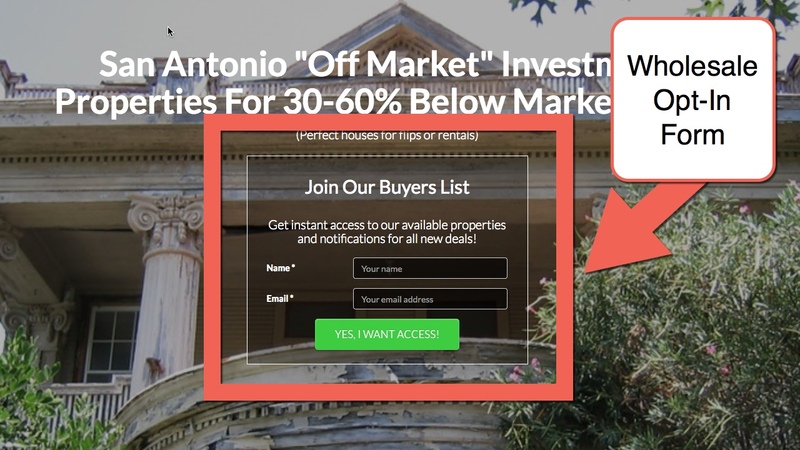 Truthfully, any of these strategies will grow your wholesaling cash buyers list. However, if you need to find cash buyers for wholesale deals now, your best bet is to do it online. The first step is to have a wholesale website for your business. Then the rest of your online marketing will direct cash buyers back to your business site so they can leave their information with you.